"Melody" was created in 1970 by Laszlo Tar. 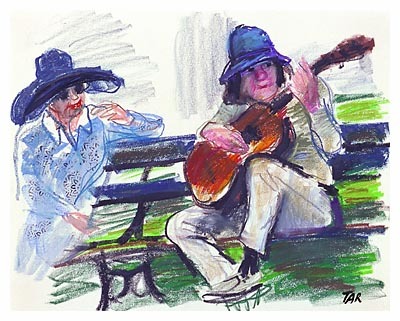 Sitting on a bench in Washington Square Park a musician plays his loving song as a stranger listens on with pure enjoyment. This is a typical scene in this wonderful and historic park and Laszlo Tar was there to capture the magic for you. The original is an Oil Pastel drawing on paper and the print captures the expressiveness of that medium in perfect detail.